As of January 1st 2017 all Ontarians with a electricity bill began receiving 8% off their electricity bill. 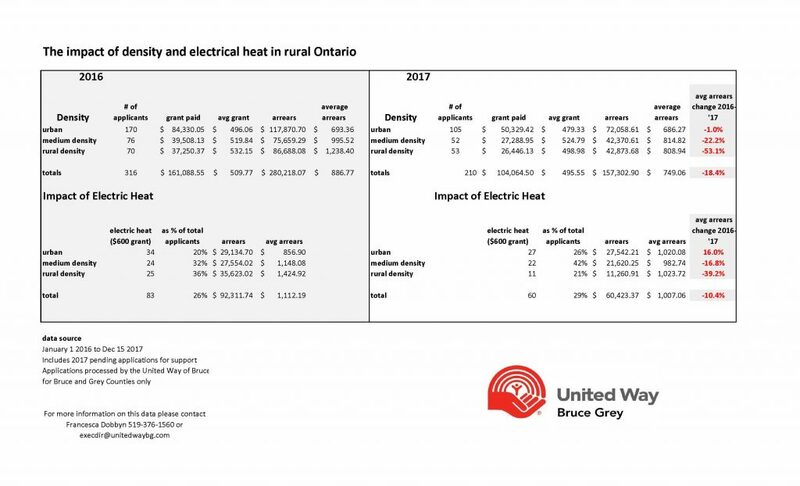 Further reductions were announced through changes to the RRRP (Rural Rebate and Reduction Program) and other tweaks to the billing processes. The OESP was enhanced with increased rebates and wider eligibility. We can only speak to our experience, so the data below is just what the United Way is tracking. But it seems to be working. Average arrears has dropped significantly for rural residents. We had a few urban electrically heated people with massive bills this past spring, which has tainted that data. When you have 4-5 households with bills surpassing $5000 seeking support, it really can mess with the data.